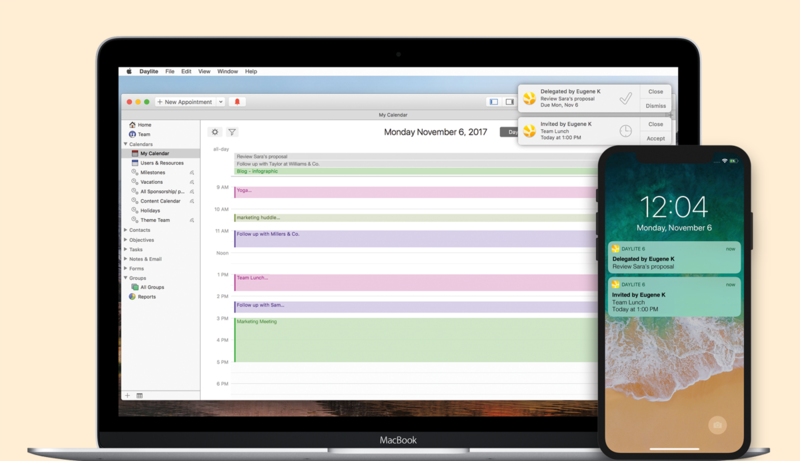 The popular Mac CRM used by small businesses, Daylite, released Push Notifications so users can get updates immediately for appointments and tasks within their team. The feature was well worth the wait. It gives greater visibility to delegated tasks, meeting invites and tasks thereby increasing efficiency. Daylite, the Mac CRM & Project Management App for small businesses, has just released a new Push Notification feature. Small business teams can now get instant notifications right on their Mac, iPhone, and iPad when they're invited to a meeting or get updates to delegated tasks. Daylite is used by thousands of small businesses world-wide to manage sales and projects in one place. With Push Notifications, users will be notified when they have been invited to a meeting or even when an appointment changes. They will also be notified when they have been delegated a task, or when someone completes a task they have delegated. Instead of waiting for a team member to open Daylite in order to be updated, they'll get an instant notification right on their Mac, iPhone and iPad. This new capability will help businesses improve efficiency, particularly for those that work on the go and those with multiple offices. "The feature was well worth the wait. It gives greater visibility to delegated tasks, meeting invites and tasks thereby increasing efficiency," says Yussuf Mwanza, Managing Director of MZA Planning, who has been using Daylite for a decade. Daylite is an award-winning Mac CRM and Project Management app for small businesses. Daylite has been developed by Marketcircle since 2002 and is used today by over 10,000 small businesses world-wide to manage sales & projects in one place. Daylite is a native Mac app allowing users to access their data even without an Internet connection, with the convenience of syncing their Macs, iPhones, and iPads in the cloud. For more information about Daylite, visit http://www.marketcircle.com.